Fish recipes are fun to prepare because you get the chance to experiment with your favourite spices, herbs and seasoning without the fear of getting it wrong. Still, you want a fairly seasoned fish; do not go overboard with the seasoning so you can still savour the natural delicious taste of fish. My favourite fish to grill is Tilapia. It is flat and has a wide surface area to work with. The skin has this moderate firmness that ensures that the fish will be cooked quickly and the fish will not disintegrate on you. The story is different if you are using skinned tilapia. You can use any other fish. The main ingredient you need is the fish itself, in this case Tilapia. Feel free to use your favourite seasoning, spices and herbs. For instance, I used parsley but you can replace that with rosemary, basil, Nigerian scent Leaves or Nigerian curry leaves. If you don't like garlic, use onions instead and so on. You can even add Ogiri to your marinade if it catches your fancy. lol. These are my favourite spices and herbs for fish. You can try these and let me know if you like the mix. Peel the garlic cloves and pick the parsley. Pound the garlic cloves with the habanero pepper and parsley using a mortar and pestle or any other kitchen tool/gadget that lets you grind/blend ingredients without adding water. Cut the oranges into wedges. The 2 oranges give 16 wedges. Scale the fish and remove the intestines and gills by gently opening the opercle (gill cover) and removing everything from there. Do not cut open the side of the fish to remove these. That way, you have a pocket to hold the stuffing rather that an open side that can't hold anything. Where I live, the fish mongers do this for me upon request. When done, rinse the fish very well with clean water and set aside. Pour the vegetable oil into a bowl. Add the ground garlic, parsley and habanero pepper. Add the crushed stock cubes, black pepper and salt. Mix very well and set aside. Dry the water from the fish using a kitchen paper towel. 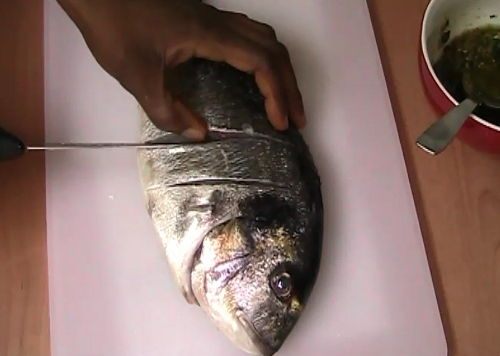 Make deep slant cuts on both sides (the flat sides) of the fish. I usually cut till my knife touches the bone. Stuff about 3 orange wedges into the gill space. Scoop the marinade into the cuts made in step 2 making sure to get as much marinade into the cuts as possible. Put some into the gill pockets too. Transfer the fish to a wide enough aluminium foil sheet. 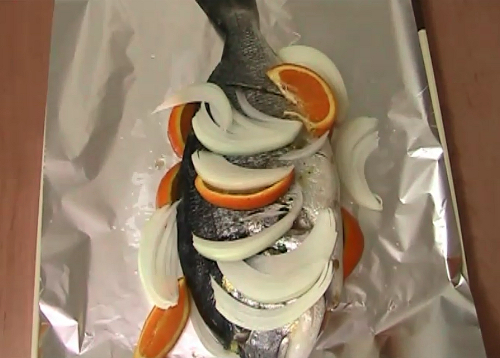 Squeeze some orange juice (from the wedges) on the fish and add the remaining orange wedges and the sliced onions onto the fish. If you are preparing more than 1 fish, remember to reserve some of the ingredients for the other fish. Place another sheet of aluminium foil on the fish and fold the 2 sheets around the fish to make an envelope. Place the envelope(s) in the fridge for about 1 hour to marinate. After 1 hour, set your oven to 200°C / 400F to preheat for 10 minutes. Put the fish envelope on the oven rack and bake for 20 minutes. Remove the top foil sheets and rub the barbecue sauce on the fish. Set the oven to grill (broil) and grill for 10 minutes. If you will serve the fish with Fruit Skewers, put them in the oven to heat up and char for a bit. That's it! 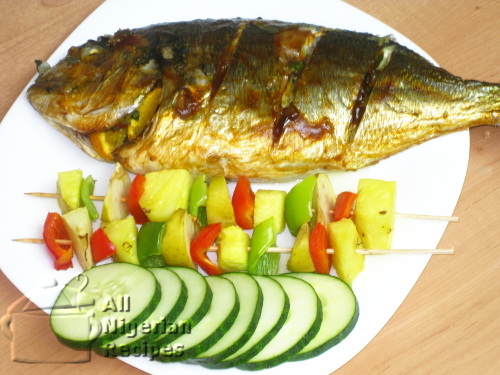 Serve with any Nigerian Rice recipe, Fruit Skewers or just a chilled drink.